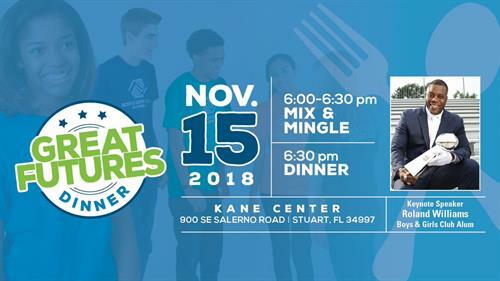 Great Futures Dinner provides an opportunity for donors, community partners, and volunteers, to meet with and hear from the direct beneficiaries of the Boys & Girls Clubs of Martin County Club experience. This memorable dinner is designed to engage our supporters and our young people who are forever changed by their generosity. Great Futures Dinner attendees gain inspiration from a renowned Keynote Speaker, a Club Alum, and current Club Member. This year we are proud to welcome Roland Williams, BGC alum, Super Bowl Champion, and motivational speaker, as our Keynote Speaker.